Do you know the old idiom that a picture is worth a thousand words? I dare you to take a look at these photo’s from Avanaut‘s photostream on Flickr and not simply be amazed. By using only LEGO Star Wars characters and a bit of ingenuity, he has created some amazing photo’s that really need to be seen to be believed. Check out below to jump to see a sampling of some of his pictures, and then on his site for more! You just have to love fan art sometimes, don’t you? Flickr user Shobrick created an image entitled Stormtrooper RIP that is simply amazing to look at. Not only does it perfectly capture a scene in which many of us have wondered (Do stormtroopers mourn their dead? ), but also amazingly makes you feel sad for the grunts of the Star Wars Universe. It is an amazing photo, and you should click below the jump to get a look at it. If your interested in buying a print, you can click here. What are you waiting for? Check out the picture! I’m fascinated when people build cool things with Legos. While I played with the tiny bricks and put together sets like Chewie on the AT-ST, I still didn’t have enough imagination to create items of brilliance from scratch. That’s not the case for Flickr user Flynn2000, though. 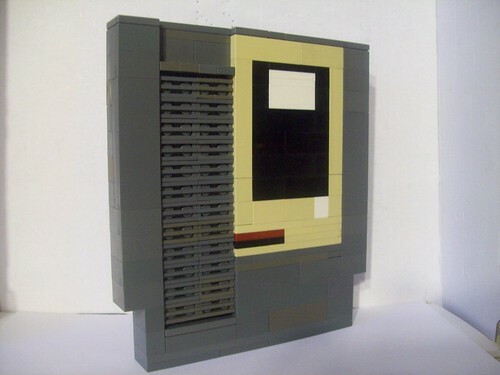 This person put together a full-sized Lego version of an NES cartridge. In the photo below, Flynn2000’s version is shown next to an original NES cartridge for scale. Pretty accurate. Flynn 2000 has a lot of other really cool Lego creations, including the Ghostbusters’ headquarters and the Back to the Future Delorean, among others. Check out his Flickr stuff here. Thanks to jeffisageek for posting this neato find. Follow Us to the Nerdy Twitter Avatars! This needs to be nerded up. When I wake up and realize that tweeting is happening at 5:30 a.m., I want to throw a shoe at the culprit… unless the culprit isn’t a bird, but a Twitter friend. And if the culprit is a nerdy Twitter friend, I want to throw a bunch of Mario’s gold coins at them because said friend is awesome. Such is the case with our friends at NerdSalad, who pointed us to outstanding work of artist Adam Koford. Koford has shot that bland Twitter bird avatar with some weapon more dangerous than a BB gun and turned it into outlines of nerdy goodness. Want Wolverine to represent you? Have a soft spot for Link? How about… um… Nancy from that old comic strip? Koford has your back. Check these out. Check out more of Koford’s work in his Flickr gallery. Are there any characters you think are missing? By the way, follow us on Twitter @Nerdbastards! While you’re at it, follow our friends @NerdSalad, too! When you’re snacking on PB&J made from unhealthy white bread, what do you start thinking about? If you’re a certain Flickr user, you apparently think about sculpting a pseudo-Amazonian princess. mleak used 11 loaves of Wonder Bread to create her Wonder Woman (get it? ), using the carbs for feet, hair and everything in between. In her Flickr gallery, she states that she originally made her creation in her own height, but nature had its way with Princess Diana and shrunk her a bit. While I don’t see a resemblance to the Wonder Woman we know and love, I still think this is an awesomely creative project. If schools would get kids to do stuff like this instead of doing those hand-turkey things year after year, our world would be a lot more interesting. Thanks to ComicsAlliance.com for the tip. Ahhh Flickr how you amuse me. I stumbled upon this little gem this morning and thought it was the greatest thing. Some douche with a banged up car got it tagged with a “Chuck Norris Was Here” along with a bootprint in the dent. I’m still not sure if Chuck Norris is actually reasponsible for this or if its the product of fan ingenuity but I have a feeling that alot of fans will be expressing their admiration to the legend this way.